Everyone knows Peanuts, the comic strip and the television series featuring Charlie Brown, Snoopy and the entire Peanuts gang. The comic strip, which included more than 17,500 comics, was created by Charles M. Schulz and appeared in thousands of daily newspapers from 1950 to 2000. The television shows that were created based on the comic strips became iconic television specials and many of us grew up with them. The specials include the likes of A Charlie Brown Christmas and It’s The Great Pumpkin, Charlie Brown and these shows still air every year in the appropriate season and are also readily available on DVD. Charlie Brown's friends eventually grew to include a cast of 18 interesting and diverse characters including Snoopy, Linus and Lucy van Pelt, Woodstock, Sally Brown, Schroeder, Peppermint Patty, Marcie and Pig-Pen. 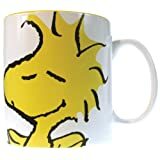 Some of these friends have been 'mugged' and are available on a coffee mug for fans and collectors, through Amazon, right here on this page. The Peanuts Gang Has Been MUGGED. Coffee MUGGED, that is. 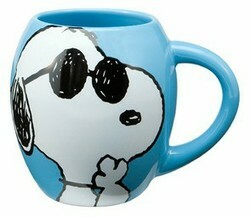 Snoopy has been in Charles M. Schulz's comic strips since almost the very beginning. He appeared on October 4, 1950, just two days after the very first Charlie Brown cartoon made its debut. 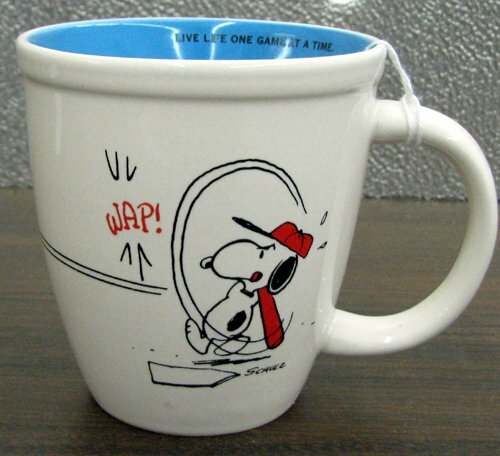 This 18-ounce ceramic Vandor mug is an officially licensed Peanuts product and is both microwave and dishwasher safe. 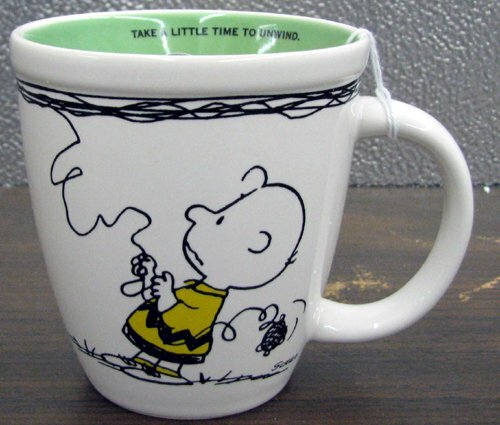 A great mug for a Peanuts fan. Love this image of Charlie Brown, Snoopy and Linus! Happy Holidays from the Peanuts gang. 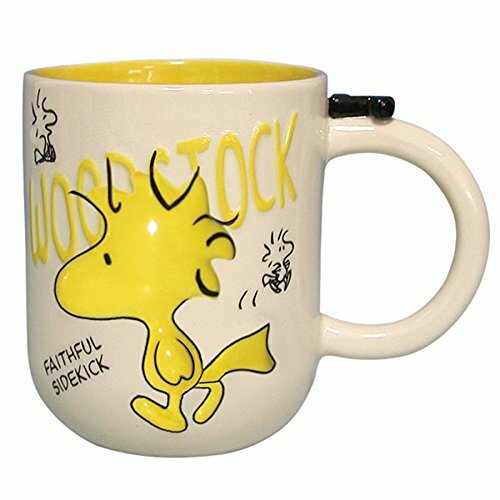 Woodstock is the little yellow bird who is Snoopy's best friend. He first appeared in Charles M. Schulz cartoon strips on April 4, 1967. 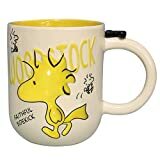 This cheerful Woodstock coffee mug features Woodstock, Snoopy's 'faithful sidekick' on a white exterior with a bright yellow interior. It is a 14-ounce, 4-inch tall ceramic cup that is both dishwasher and microwave safe. 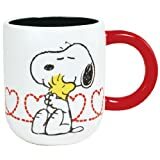 This fun Peanuts coffee mug features Snoopy, Charlie Brown's 'best friend' on a white exterior with a bold red interior. It is a 14-ounce, 4-inch tall ceramic cup that is both dishwasher and microwave safe. The Flying Ace Snoopy in "It's Hero Time." This blue Vandor coffee mug features Snoopy, one of the most popular Peanuts characters in his role as the World War I The Flying Ace, which appeared in 1965. 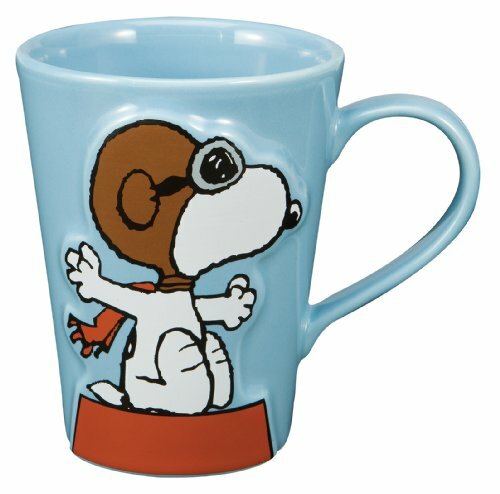 In order to become The Flying Ace, Snoopy would appear dressed in goggles, helmet and scarf, perched atop his doghouse. His enemy was The Red Baron who never actually appeared in the comic strip but who we knew was there because Snoopy would cry, "Curse you, Red Baron!" as he plunged from the sky to the earth. 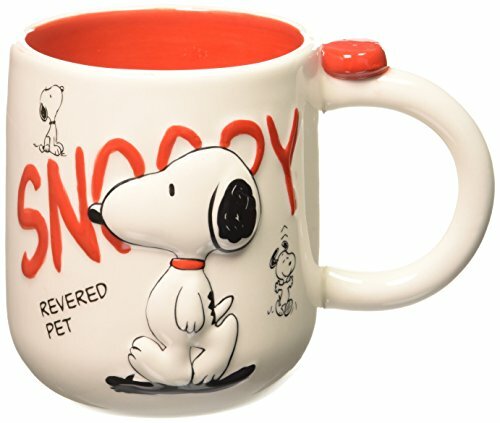 Vandor's Peanuts mug is a sculpted, 14-ounce ceramic mug that is both dishwasher and microwave safe and a must have mug for Snoopy fans! 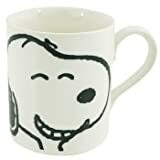 Amazon customer Ansari says that this mug captures the true essense of Snoopy and that it makes him smile every time he uses it. 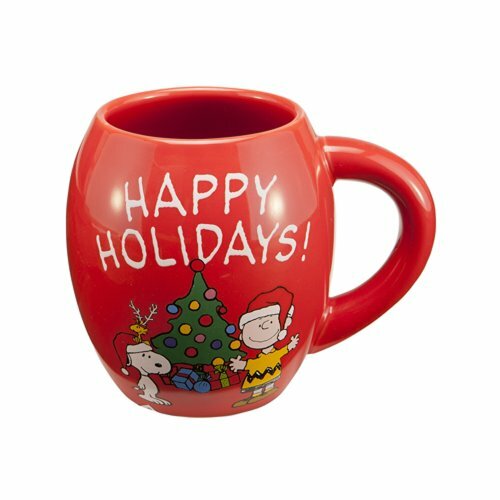 Hallmark has a wonderful line of Peanut-themed coffee mugs, which hold 12 ounces of your favorite hot beverage and are microwave and dishwasher safe. They feature a white exterior and a colorful interior with an expression written on the inside like, 'Live Life One Game At A Time' or ''Life Doesn't Get Any Better' written on the inside. 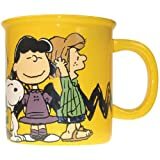 On Hallmark's mugs you will find a few more of the Peanut gang including Linus who is Charlie Brown's best friend and who went everywhere with his blanket and Lucy who is the bossy older sister of Linus. All available through Amazon. Don't forget, Amazon offers FREE shipping on sales worth $25 or more. 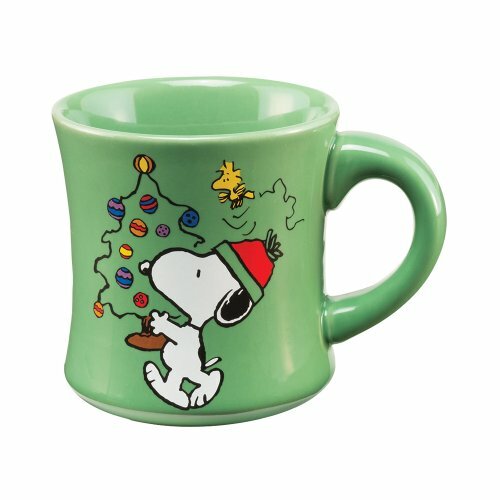 Fans of Snoopy, Charlie Brown and the whole gang will want to make sure they have a Peanuts CHRISTMAS coffee mug. LOVE this one, which features Snoopy getting ready for Christmas! 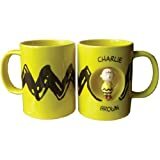 Be My Valentine, Charlie Brown - Charlie Brown's Be My Valentine was the 15th Peanut television special. Learn more about Charles M. Schulz' story here. 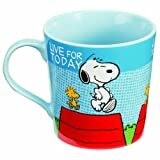 Department 56 Snoopy Coffee Mugs - You'll love this line up of mugs from Department 56. The Peanuts Movie Wall Calendar - Celebrate with the whole gang all year long. The Peanuts Movie on Pinterest - If you're on Pinterest and you love Charles M. Schulz's Peanuts, you won't want to miss this board. And whether you are an accidental collector or not. Sometimes a coffee mug collector doesn't even know that he or she is a collector until he stops and assesses his mug situation. And as we discovered, many of us are accidental mug collectors, having amassed more mugs than we might care to admit. If you don't already have it in hand, grab your favorite coffee mug and join the fun by visiting our page Who Collects Coffee Mugs where you can share with us your coffee mug reality by participating in some of the polls. Make sure you do not miss the comment section at the bottom of that page where you can read some of the interesting mug stories that people share. Finally, if you are on Facebook, you might also enjoy participating on the page, I Love Coffee Mugs, where you can get MUGGED, too. In case you did not find the mug for you. 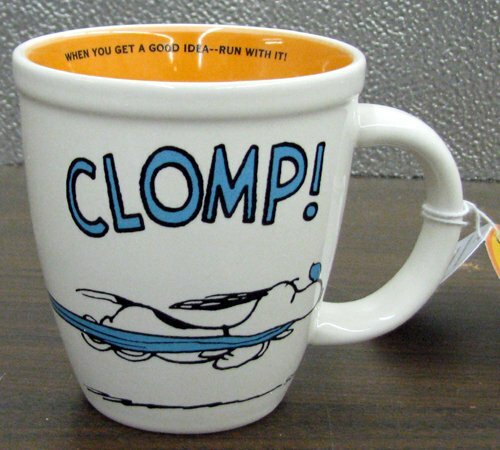 Which Peanuts coffee mug took your fancy? That's too bad, Theresa but good to know. Thank you for sharing. Did you give your feedback to Amazon? 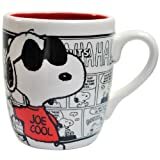 I ordered the blue joe cool mug from Amazon.com. When I got it, I was so disappointed that the mug was a darker blue than is shown in the picture. Hi, Joyous - I checked both eBay and Amazon and came up empty handed. I even searched Google. I would recommend you start a Saved Search on eBay and eBay will let you know if one becomes available some day. You'll find instructions on how to do a saved search on eBay here: http://treasuresbybrenda.blogspot.ca/... . I'd actually set up two searches. 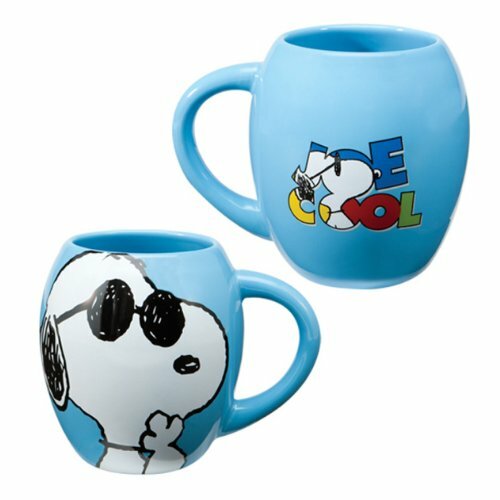 One for "Peppermint Patty Mug" and one for "Peanuts Vandor Yellow" without the quotation marks. Agreed, they're wonderful. How could anyone pick just one? 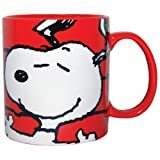 Hi, Pamdugasz - I found these Schroeder items on Amazon: http://tinyurl.com/d7sqd3m Unfortunately, only a golfing mug that comes up in the search results but does not actually show Schroeder in the photograph of the itme.